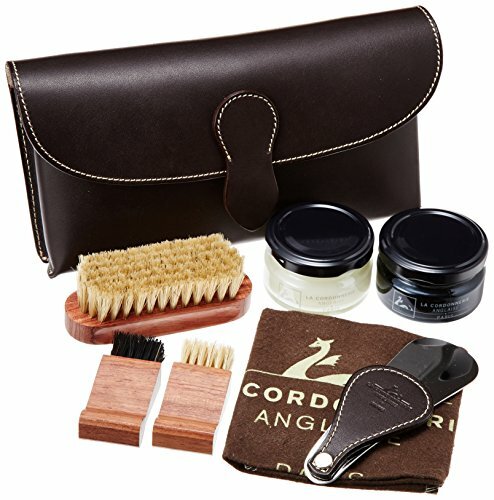 Luxury France made Shoe Care Travel Set Excellent gift idea for Winter Holidays, Christmas gift, Father's Day, Mother's Day, birthday gift, man or woman gift. Contain High quality items: 2 Shoe Creams ( Black & Neutral), 2 jar applicator brushes, one small size polishing brush, one cleaning and polishing cloth, one Stainless Steel shoe Horn with leather casing. Genuine leather travel case high end quality manufactured & imprinted with La Cordonnerie Anglaise logo. Excellent gift idea for Winter Holidays, Christmas gift, Father's Day, Mother's Day, birthday gift, man or woman gift. Contain High quality items: 2 Shoe Creams ( Black & Neutral), 2 jar applicator brushes, one small size polishing brush, one cleaning and polishing cloth, one Stainless Steel shoe Horn with leather casing. Genuine leather travel case high end quality manufactured & imprinted with La Cordonnerie Anglaise logo. If you have any questions about this product by La Cordonnerie Anglaise, contact us by completing and submitting the form below. If you are looking for a specif part number, please include it with your message.